Having launched in January 2015, the bike park at Constantia Uitsig is being updated constantly, and will ultimately consist of a meandering cross-country track stretching over 3.5 km, amidst indigenous vegetation and the scenic beauty of Constantia. In addition, there is now also a dual slalom race track and a Bike Barn – offering spectators a cozy hideout and cyclists, a pitstop with bike repair facilities on site. Designed by Downhill World Champion, Chris Nixon, the tracks are ideal for honing one’s bike handling skills. BMX’s, mountain bikes and cyclocross are all welcome. In March 2008, proprietor Anthony Rawbone-Viljoen was proud to announce the launch of The Oak Valley Mountain Biking Experience. Established by Pieter Visser, previously the Oak Valley winemaker, who himself was a keen mountain biker, the trails start and finish in the oak-lined avenues at the entrance of the Estate. 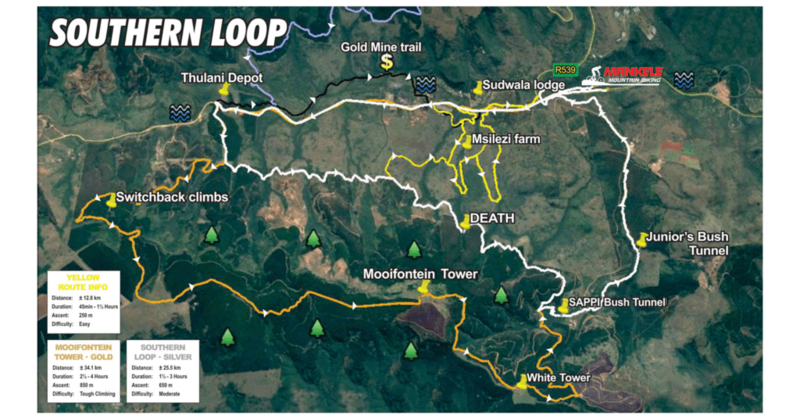 There are 3 marked routes: a 14 kilometre Blue Route for the family; a 24 kilometre Red Route for stronger riders; and the 32 kilometre Black Route for more advanced riders. The trails consist of a large percentage of well-maintained singletrack, with bridges over farm fences and streams, making for a highly enjoyable ride. The biking trail takes the rider through beautiful natural scenery, including forests of ancient oak trees, through vineyards, through apple and pear orchards and across sub-clover/grass pastures, set against the stunning backdrop of the protected fynbos on the slopes of the Groenlandberg Mountain. Due to the mix of terrain we recommend you use a good all round tyre. The fee is R40 per rider, payable at the security office located at the entrance gate to the Estate. The trail has been described by expert mountain bikers as the best of its kind in the Western Cape - a 5 star experience! After your ride, visit The Pool Room Restaurant, Deli and Wine Tasting venue located 500 metres from the start of the trails. The Pool Room is open for breakfast & lunch from Tuesday to Sunday and dinner on Fridays & Saturdays. The wine tasting bar is situated at The Pool Room and is open 7 days a week, Monday to Sunday, including public holidays. Have fun and enjoy Oak Valley's MTB Experience!